A Natural Solution for your Dog! How Could Horses Benefit From Essential Oils? 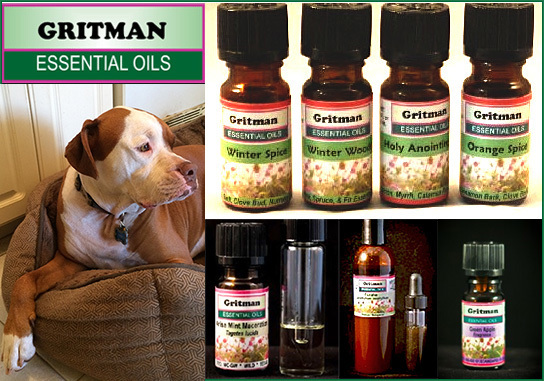 Gritman provides quality essential oils and products for horses as well as their human counterparts. Here at Gritman we believe that horses are more than flesh. They are also energetic beings with emotions. Essential oils move emotions and many horses benefit from essential oils especially if they are traumatized, stressed, or nervous. Then Dogs can also have physical issues such as stiffness - pain, breathing problems, and insect/parasite bites. Since horses are large animals, they can require large amounts of products. Gritman has developed techniques to minimize the need for copious amounts of oils. This is called emotional clearing and it is an easy technique to learn. Gritman is a family based business operating a school as well as a manufacturing facility. We are knowledgeable and are available to share our information. We are interested in talking to our customers especially if they need help and understanding. Gritman has been in business for 19 years and is a leader in education and quality products for horses, dogs, and humans. If the horse is nervous, use the blend Calming or Lavender essential oil. If the horse is suffering from colic, use Peppermint or Ginger essential oils.